Description: Overcomer’s members celebrated another World Conference by stating what they have learned and any testimony that they have. Sis. Kim: Dr. Pauline spoke about pride and selfishness. We (my family and I) did not care what will happen and what Satan will do. I just want to encourage you, with a testimony of not having selfishness. By me going to the ATM I saw the money that was not there before, and if I did not go to take the money, I wouldn’t know what would have happened. I just want to thank God for what God has done through Dr. Pauline and Rev. Peace. I am going to sow a seed with that money because only Jesus could have put that money in that account. Dr. Pauline prayed a prayer against selfishness, believe it! My testimony this morning is that he is a big God! A miracle God! Deaconess Monica: I am so thankful for Dr. Pauline and Rev. Peace and Overcomer’s House! I received a message that froze me: “I never put in that church to sit, I put you there as a watchman” I was looking at the watchman definition, “a security person.” Well, this year I am stepping up and putting it into action. I received a mission to give Dr. Pauline money. I did not have it, but it kept taunting me, and I had to give in the money. I prayed to God saying, “God I do not know how to get this money, and so provide.” While in New Jersey, I got four envelopes full of money, and I wrote that check. I praise God because no matter what God will provide, and he will guide and protect us. All we must do is look to him and seek him. Deaconess Nora: I have not lost my right to dance because I will keep on praising him. God is not a God where you can get familiar with us. Just like a Jamaican, who when you get comfortable with them they switch up on you. Dr. Pauline taught on Grace, Mercy, and Forgiveness and the legacy of all the things we should use to pray. It hit me; there is a point that she preached on, about tithing, seed and all of that. I had to get on my knees and pray. I declare that I have claimed my blessings and that God will continue to take care of us. This year God did take care of us because when we are usually tired after New Jersey, he gave us energy and strength this morning. A miracle happened in New Jersey and we are going to stand on that blessing and use it as a point of contact with God. Sis, Beverly: When you look at our mother yesterday everything changed. She looked so young. This morning, I felt rich!!! Anybody that was poor is rich is in Jesus name!! Satan cannot stop us again! Deaconess Roslyn: Amen! I want to give God thanks for New Jersey this year. Last week when we looked at the weather, I said God how will we go to New Jersey this year. We prayed against accidents this year. We had good weather going and coming. I want to thank God for the reception this year, they (Robert Treat Hotel) treated us royally this year. We had multiple options for drinks, customized food options, and an abundance of food. When I was walking around and praying, I prayed that God would change things. When I got to New Jersey, I said God: Every year we get to New Jersey it is like we are fighting a war. Can we get a session this year, that when you speak through Dr. Pauline, she does not have to get physical to do deliverance? And then God spoke through Dr. Pauline saying that she does not need to go chasing demons this year. God changed things and when she spoke things changed, and we praised and rejoiced while being delivered. And we were not so tired!! Even after the ministration! For the teaching, one thing that stood out for me is the difference between Grace and Mercy. Grace is when God pardons me for my ignorance. But when I have already known, I need to repent and then ask God for mercy. In speaking about forgiveness, she brought forth hat we need to forgive and forget. But at the same time, because we have forgiven the person, we need to ask God for help because we should not go back to the person get the beatings. When we hold on to the anger, we are safe because we know we don’t have to deal with that person anymore. But even when we forgive them, that can still happen when the forgiveness is a haven. So, we don’t need to get angry and throw Holy Ghost fire at them but just forgive them. Sis. Victoria (Age 2): Say Sorry! Sis. Sharon: I was not there but I hear the testimonies and the Holy Spirit take me over and hug my sister and I prayed for her! Sis. Alma: (Sings: Just hold on to Jesus, and he will bring you through the storm) This year New Jersey, I felt light. I did not know that I had selfishness and pride in me. But as Dr. Pauline told us to breathe out, and I felt like things were coming up. I said, “Wait, God, I had pride? Had I selfishness? Had I covetous? No Jesus let it go from me.” As the conference was going, I felt things leaving me and I became light. When I go back to Jamaica and I get into trouble, I know God will have his mercy on me. Because there are people that did not want me to come to the conference, and they will want to get me in trouble. But I know that God has gone before me, and he has put it under control. Deacon. Alton: (Sings: Mighty God of war, Yahweh come and do only what you can do) It’s my first year going to New Jersey World Convention, we had favor because my car was acting up, and we were still able to come. When Dr. Pauline was preaching about Selfishness and Pride, I was coughing up and felt everything come from me. When I went up to put a seed of 1,000 I received a message from God, saying that my house will be paid off. Deaconess Rose: I have never missed the world conference, and for the past 13 years, I only missed Thursday nights and I wanted to do that this year. So, I prayed, and as I was on the phone, I heard a clear voice say: “There is a window open, call the lady now?” I was never someone to hear the voice of God so clear and distinct, but I heard it. I hung up and called the HR department and they said to go. I called Mama Peace and I said I want to go with you guys. My brother in law said YAY, and he said to take the car. He was so happy, and I was so happy that I was able to be there from the beginning to the end. God already paved the way when he told me the window was open. When we prayed against unforgiveness I felt a shift happen. We needed that prayer, because when we don’t forgive it holds us bound and keeps us going back to the person. Once we forgive and we see the person, it does not hurt, and forgiveness is the saving Grace. Sis. Victoria: I was admiring Dr. Pauline, the way she was speaking and how she spoke on different levels. She spoke about the role of the intercessor, they should pray for souls and the servants of God. Yesterday when Dr. Pauline was praying I coughed, it was like a rope around my neck, I said nope you got to come up. It comes up and I had to go to the bathroom to purge myself. It was like I went to my own personal deliverance by the spiritual guidance of Dr. Pauline. I have been to other places for deliverance, and it felt good to have this breakthrough. Sis. Andrea: (Sings Awesome God, how great art you are) It’s my fourth year in Jersey and I had a ball. I did not know we were coming home on Saturday night, I wanted to stay. When they speak about Jersey, I started to save up my money and put it aside. I thank God because I will start saving up for next year. I have not gotten paid for seven weeks now and I thank God because my bills were paid! What Dr. Pauline pointed out to us, really hurt and it hit me. The forgiveness part really speaks to me and the part about wanting something someone has. It is not right to just take something from someone, ask nicely and nicely you will get it. What Dr. Pauline taught us from Thursday night, I want to give God thanks for all he did through her. I bought the book and I want to read it more and apply it to myself! I want to give God thanks for New Jersey and I am paying for next year’s conference. Bro. Jeremiah: I never got to make it there on Thursday. It was like a lot of stuff was stopping us. I do not even know how I made it up there yesterday! I don’t know where to start, I just got to give God thanks, because I do not know where I would be right now. I have never since my aunt move so quickly, I had to cry unto God in thanksgiving for her! There are times I just feel like giving, and I thank God for letting me be here and I am just taking it one day at a time. Sis. Rochelle: (Sings Hallelujah Our God Reigns) I thank God because all of the things were revealed unto me and I have started working on them. I learned about Common Grace and Saving Grace. Sis. Angelique: I learned a lot from New Jersey, and what I took from Aunty Pauline’s teaching is that Grace is a time of hopelessness, and you are asking God to help you out. I learned about Mercy, mercy is a time where you go to God to repent and ask God for forgiveness, we all sin and make mistakes. What I learned about Prayer, is that instead of going to God to ask for forgiveness, we go to complain. We need to go to God to pray, and not just stating our problems. My testimony is that I thank God for what he has brought me through, and for life. Sis. Brianna: I learned about Saving Grace, that God has created you and you have an extra advantage with God. For the favor, my testimony is that school was hard last year and I did not want to do anything. This year I took a Catholic school test and I got into three schools. Sis. Roshane: I learned a lot on Saturday, especially in the discussion circles. A sister in the group got sick by having a snake bite. A man and woman looked rugged. They gave her something from their pocket and when she put it in her mouth she got better and rub the same thing on her leg and she got better. If she wasn’t in that predicament she would not have taken it. God works in mysterious ways, the things you didn’t think you would do or encounter, God put you in those situations. She knew it was God because she turned around and didn’t see those people. It caused her to humble herself, only you can do this Lord. She could have gone to the hospital and got better but God put her there to teach her humility. It touched me because I am learning humility on my job dealing with the administrators. My testimony is that we got there safe. I had to keep circling and turning, and GPS kept rerouting because of multiple accidents. Thank God for clear roads coming back. It was my first time driving and I made it there. Thank God for protection. Sis. Naa-Afi: I thank God for the teamwork and effort that was done. What I learned was Forgiveness, because so many people have done wrong to us. But we need to forgive them, even if we do not want to talk to them and share the things we used to share with those people. We should always forgive those people and then we are able to move on with our lives. Forgiving is something that God wants us to do. Rev. Peace: I want to thank God for Dr. Pauline, Pastor Fred, Overcomer’s Solider & Overcomer’s Strength (Rev. Althia). I want to thank God for OUR Maryland branch. Truly Romans 28 talks about us not knowing how to pray, and I said after the prayer session that I really need to know how to pray. Thank you, Dr. Pauline, you helped teach us how to pray. No matter how beautiful the commode is, we can not eat out of it. Same way, if we do not take care of ourselves, we can not pray as we ought. For the first time we went to New Jersey, I did not lose my voice, I did not need to fast. There is a change in the atmosphere. 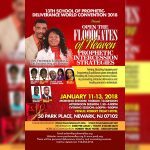 I thank God for how he manifested in New Jersey. I went to New Jersey, with not a lot of money, but when Dr. Pauline listened to the Lord and she said to give. I gave, and I got back and left New Jersey with more money. Rev. Althia: (Sings Your Grace and Mercy!) I thought about everything and we never lacked, everyone came in and fell in line and God did what he had to do. I just want to say: Lord, thank you because it was not the hand of man that did it. It was God that did it. I can not turn to somebody and say thank you, I can only turn to God and Say Thank You! God moves in ways we never thought about. Dr. Pauline spoke about Anger, unforgiveness, selfishness, and pride. I am realizing that we all have some stuff that does not look good, and it is especially bad when we get called out and react negatively. I thank God for the message in New Jersey and what he did. For the first time, when we set up the arena to fight, the Lord just changed things. Even though we went to fight, the Lord said, No, it is okay and alright. We were relaxed in New Jersey. Testimony: We talked about Grace, and when Dr. Pauline prayed for family by family over the New Year and blessed us. And we saw the miracle of God with the DMV and EZPass system. Hallelujah!! The impossible bill that could not be paid in the time they wanted, was reduced dramatically, and we paid only a small amount of money. I called my brother and sister and they praised God for me. Hallelujah!! !